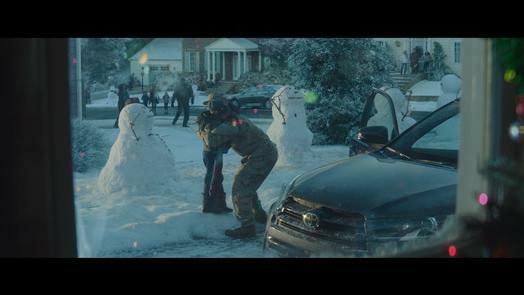 Toyotathon is back for its 39th year with a holiday spot that showcases a heartwarming homecoming. The 90-second “Home for the Holidays” spot premiered Wednesday night, November 28th, on NBC’s primetime Christmas in Rockefeller Center, with a throw from NBC’s TODAY Host Al Roker. In a multi-network approach, the 90-second spot also aired on the Wednesday night episode of CBS’ The Late Late Show with James Corden, complete with a personalized throw from Corden, during the FOX Sports Thursday Night Football Toyota Halftime Show, with a live throw from host Michael Strahan, as well as on CBS This Morning. Additional :90-second airings include FOX Thursday and NBC Sunday Night Football halftimes throughout December. Created by Saatchi & Saatchi, “Home for the Holidays” tells a familiar narrative: a servicemember is arriving home for the holidays after a military deployment just in time to be welcomed with a special heartfelt greeting thanks to the help of his family and neighborhood friends. The homecoming brings pure joy to the family, reminding viewers what’s most important this holiday season.